Yes, they did it by illegal immigration and breeding. AND, they still get American benefits, to boot, since it's still (supposedly) American territory. Try googling McGonagle Canyon. Read at your own peril. Being homeless and living in a shack is differently than going out in the street begging for money. Although-- this does happen in Mexico, I never seen Hispanics out begging for money. How is working and living in a shack the same as living no where and begging for money?? We weren't talking about panhandling - the comment was HOMELESS. If you think living in McGonagle Canyon is "HOME" then more power to you - they've got room for one more! I hear they bring fresh teens each night. Or does beggar=homeless in Exedous' dictionary? The two are very separate and distinct words. In Mexico, especially on the border, people live in Shacks. In parts of Africa, there are people who live in huts, and the native Americans lived in Teepee's. Do you consider this homeless? I am speaking exclusively of the US, since this thread isn't about Africa. Here in the US, to have a home, you have to have a little thing called an ADDRESS. You either buy a home, or rent one from another owner. When San Diego starts parceling up the canyon currently squatted in by homeless people, and they put a house number on the shrub/tree each person is squatting around/under, then come back to me. I never have either, but I have seen a man on next to a freeway off ramp on one side and his little wifey on the other. They were both anglo and they would fold up their card board signs at the end of the day and leave together. Well That shows how much you know about it. Have you ever seen their Bill Board? 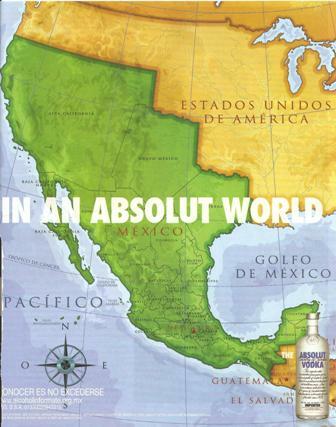 You know people are getting really paranoid when an Absolut Vodka ad makes them worry.